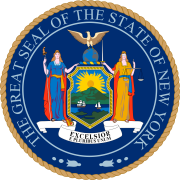 The 2006 New York Comptroller Election took place on November 7, 2006 with the incumbent, Alan Hevesi winning against Republican challenger Chris Callaghan. Hevesi was plagued by scandals during the campaign involving misuse of state funds. Hevesi won the election, resigning a few days before his second term would have begun. Alan Hevesi is the incumbent Comptroller of the State of New York. A Democrat and former professor, Hevesi was first elected State Comptroller in 2002. Hevesi served two terms as New York City Comptroller from 1994 to 2002, when he was term-limited out of the office. He was being investigated for using a state employee as a chauffeur for his wife and failing to keep records or reimburse the State of NY by the Albany County District Attorney and was found to violate state law by the New York State Ethics Commission. Christopher Callaghan, the Republican candidate, served as the Treasurer of Saratoga County, New York from 1997 to 2006. He was first appointed by Governor George Pataki in 1997, and elected to a full term later that year. He was reelected twice. [Shari Davis] is the Green Party United States Green Party Service Administrator She is an educator and their candidate for Mayor of New York City in 2017. John Cain was the Libertarian Party candidate. He is an insurance broker and former Democratic Party activist. Willie Cotton was the Socialist Workers Party candidate. He is a journalist and former Congressional candidate. Michael Cronmiller was the Right to Life Party candidate. The Right to Life Party did not obtain the signatures required to be placed on the ballot in the 2006 election cycle. Alan Hevesi was the nominee of the Democratic Party for Comptroller. He served as Comptroller of New York City from 1994 to 2001 when he attempted a run for Mayor of New York City. Failing that, Hevesi ran for state Comptroller in 2002 defeating Republican challenger John Faso. In 2006, controversial allegations regarding Hevesi's tenure as Comptroller arose including admitted use of a state employee as a chauffeur for his wife and the purported use of state employees along the campaign trail. At a commencement address he delivered at Queens College on June 1, 2006, Hevesi told his audience that Senator Charles Schumer was so tough he would "put a bullet between the president's eyes if he could get away with it." Several hours after his remarks, Hevesi apologized for his comments, calling them "beyond dumb," "remarkably stupid" and "incredibly moronic." On October 12, 2006, Albany County District Attorney David Soares' office acknowledged that it is officially investigating actions by Hevesi regarding the public employee hired to chauffeur his wife. If Hevesi is found to have violated state ethics laws, he could be fined or possibly removed from office. On October 16, 2006, Hevesi yielded control over his office to longtime political consultant Hank Morris. On October 26, 2006, Democratic gubernatorial candidate Eliot Spitzer withdrew his endorsement of Hevesi saying, "Recent developments in the Comptroller's race are deeply troubling. The outcome of the Ethics Commission investigation presents information that compromises Alan Hevesi's ability to fulfill his responsibilities." On November 4, 2006, Hevesi was ordered to pay an additional $90,000. "Considering the record as a whole, I believe there is a preponderance of evidence that the comptroller knowingly and intentionally violated New York's public officers law," Kelley said in his 24-page report to Pataki. Christopher Callaghan was the nominee of the Republican Party for Comptroller. Callaghan was Treasurer for Saratoga County from 1997 to early 2006 when he resigned to begin his campaign for state comptroller. There were reports that state party leaders were trying to recruit Rockland County Executive C. Scott Vanderhoef to run for comptroller against Treasurer Callaghan. Vanderhoef announced that he was not running for comptroller and instead announced his candidacy for lieutenant governor. Callaghan spent much of the summer travelling to the many county fairs throughout New York. On September 21, 2006, Alan Hevesi admitted that he hired an employee of the state to drive around his wife after Callaghan made a public statement on the matter and called the "Comptroller's hotline." Callaghan used the Comptroller's hotline during the campaign to call in misues of government funds specifically found in Hevesi's office. † Of voters polled in Albany, Rensselaer, Saratoga and Schenectady counties. A debate was held on October 25, 2006 by NY1. The election was held on November 7, 2006. ^ "Archived copy". Archived from the original on 2007-08-22. Retrieved 2006-06-01. ^ "Archived copy". Archived from the original on 2007-09-28. Retrieved 2007-09-28. ^ "Archived copy". Archived from the original on 2006-11-12. Retrieved 2006-11-12.